Flying into Ushuaia, we all became giddy with excitement. Our adventures in Buenos Aires had been wonderful but we had all felt the pull of desire to hit the road. After so much anticipation we all wanted to finally set rubber to pavement. As we flew in we crowded the window looking out at the jagged and snow capped peeks that we passed between. When we stepped off the plane, we got our first taste of the wind and knew we had finally arrived in Tierra del Fuego. We spent the next few days in an Airbnb awaiting the arrival of the two remaining bicycles - fingers crossed. When the scheduled delivery date arrived without the bikes we decided to head to the national park a little ways away to camp and spend the weekend enjoying the mountains, instead of stressing in the city. When we arrived at the park, we all relaxed and and were blown away with the beauty around us. Eli was so amazed that it took him 20 minutes to decide which view he wanted the front of his tent to face. How can you decide when every way you look is breathtaking (photo #1)? 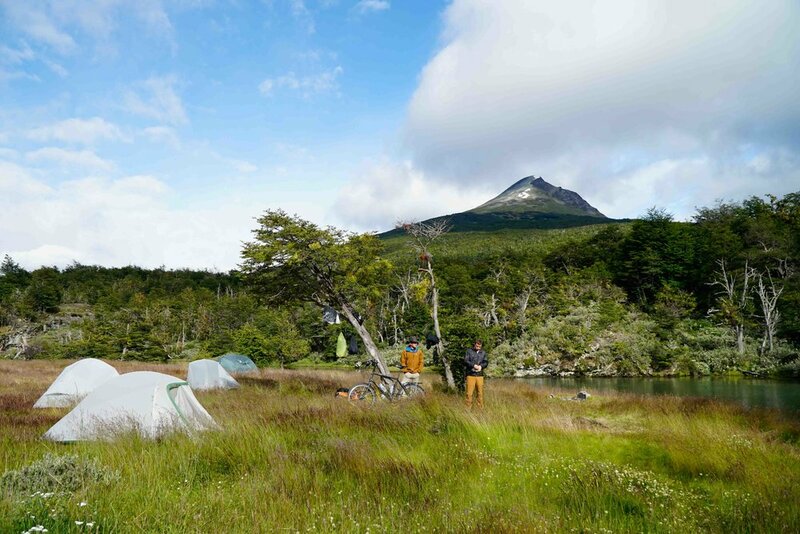 After setting up camp, we met two French cyclists who had just arrived at the end of their three month trip. It was a fitting way to start our journey sitting around a fire with them, as they ended theirs. On our second day in the park, we climbed Cerro Guanaco. A mountain in the middle of the park. From above tree line and standing on the jagged peak we could see an incredible 360 view of the edge of the world (photo #2). We had reached the end of the road. The last road. The part of the map that used to read "here there be dragons." A place we had only dreamed of seeing, yet here we stood. A dream realized and manifested into cold hard stone under our feet and open clear sky above our heads. We climbed down the mountain feeling exalted and excited for the road ahead. When we arrived back in town, we found that our bikes had finally arrived! We spent the rest of the day building them up and organizing our gear. After spending our last night in Ushuaia, we hit the road the next day. We had the wind behind us, good weather, and an open road ahead of us. We rode with light hearts, excited to be on our way after so many days of stress and waiting. We decided to ride in one day what we had intended to do in two because we had heard of a bakery where cyclists could stay for free and that was renowned for its baked goods. This turned out to be a stretch for Noah as it was his first day of riding a fully loaded touring bike. With high spirits but exhausted body he finished strong and we reached the town of Tolhuin and the open doors of the bakery. The next day was spent recovering from the ride, enjoying the incredible flood of the bakery, and meeting cyclists heading in both directions. We heard much about the road ahead and met a young Argentinian man from Buenos Aires (Andres - photo #3) who was also heading our way. The next day, he joined us as we rode north. Our second day of riding was shorter and easier than our first. We watched the sun set on the strange and new land we had ventured into and slept under unfamiliar stars.When he hit the road the next day, we encountered the wind for the first time. A blasting force hurtling directly against us. It was only 30 miles on an easy road but it was early evening before we dragged ourselves into the town. We stayed on the floor of an apartment that was owned by a young man, Franco, who liked to help out travelers and let them stay there. We met more strangers who he had met on the side of the road and invited to spend the night, asking nothing in return. He was literally meeting travelers from other countries on the street and opening his doors to them - no questions asked. We stayed for two nights and spent our rest day meeting up with friends of Vickie, the woman who we had met in Buenos Aires. Again we were shown generosity and open doors. Almost before they knew our names, we were welcomed into their home and fed amazing food (photo #4). Even though we had come half way around the world they welcomed us and made us feel at home. We were sorry to leave and head back out into the wind. We spent a long day of hard riding with the wind against us to get to the border of Chile. 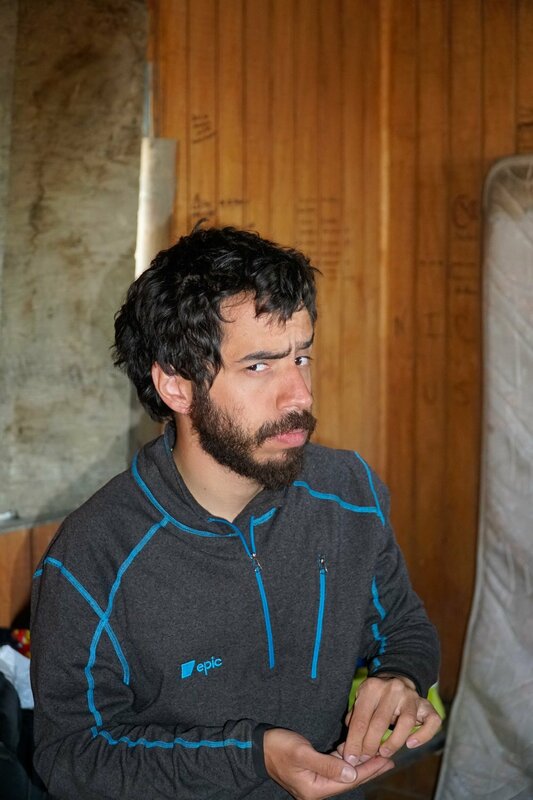 We camped out behind a gas station and started out in the morning, crossing the 13 km no man's land between the Argentinian and Chilean border patrol. We had thought that we had experienced the worst wind before but we couldn't have been more wrong. The gale force blast that we set out into was so strong that it was picking up small rocks off the road and hurling them at us. It was a struggle to stand, let alone pedal (photo #5). The bikes were buffeted and jerked from side to side and it was difficult not to be blown off the road. It took us over two hours to make the crossing even though it was on flat ground and a good road. We made it to Chile exhausted and battered. After crossing the border we took shelter from the wind at a small restaurant and as we sat and recuperated from our ordeal, we discussed how to proceed. The wind showed no sign of letting up and after talking with the owner of the restaurant we discovered that the wind was like this almost every day. We faced many miles of empty road devoid of shelter or relief. At this point we chose to hitchhike as far as we could that day. It was a difficult decision to make but faced with a long road without chance to resupply food or water, and the conditions of the wind, we chose to give up our pride and take a ride. We agreed that the purpose of our trip and the idea of Mundo Pequeño was more important than any of our singular goals or agendas on this adventure. We caught a ride with a trucker who said he regularly rescued cyclists and made it to a small abandoned shack to spend the night (photo #6). The shack turned out to be a favorite stop for cyclists passing that way and was full of graffiti of names, dates, and quotes. We listened to the wind howling outside and enjoyed a hot meal and laughter safe from its constant blast. We decided to push on as early as we could in hopes that the wind wouldn't be quite as strong before sunrise. We awoke at 5am to the amazing and stark sound of silence outside. The wind was little more then a breeze. We made a good push that morning and had covered many miles before the wind began again. The landscape around us was devoid of anything other then the occasional scrub bushes and sheep. An empty dirt road stretching out across plains with only low grass fading to low hills on the horizon. The sight of the shore line was a welcome sight and we pushed forward for the next town and the end of our crossing of Tierra del Fuego (photo #7). We rolled into town exhausted but victorious. On our last stretch we had met several cyclists heading in the opposite direction and had been encouraged and inspired to finish the day strong. As we watched the sun set and happily sat down to eat a well earned meal there was a feeling of accomplishment among us. It had been a hard week of riding for us all and we had faced and overcome many challenges since we set out from Ushuaia. Tierra del Fuego had tested all of us and we had emerged from the ordeal. We checked into a hotel - a hot shower and warm bed had never felt so good. We fell into blissful slumber feeling the joy of hard earned comfort and wondering what the road ahead had in store.